We’ve made up a great kit for making soy wax candles. While there are heaps of tutorials online, I wanted to make one using our products that was easy to follow. 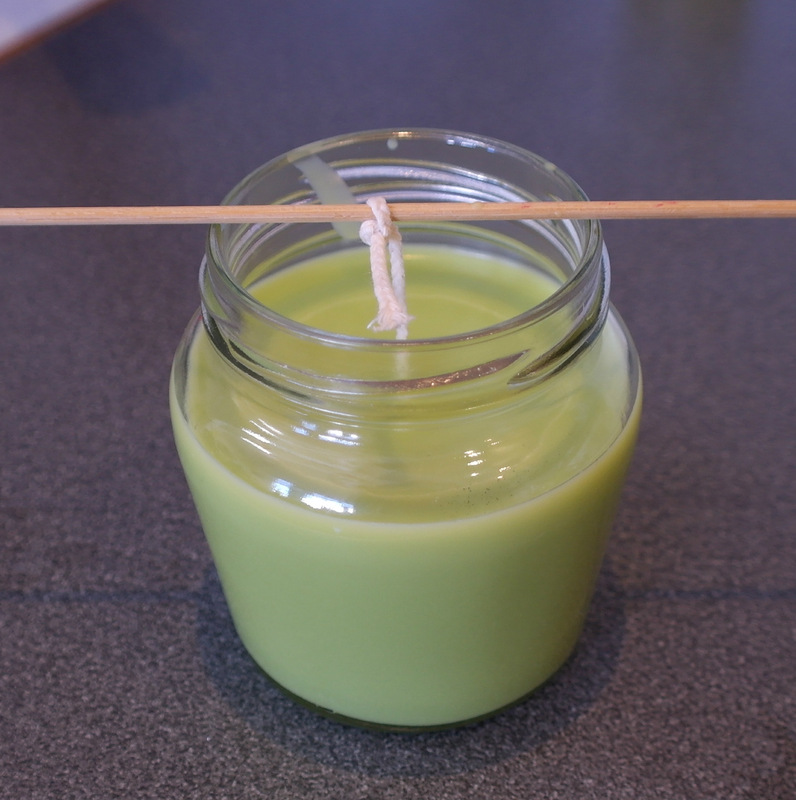 Our kit contains 1kg of soy wax, which is enough to make 8-10 smallish jar or cup candles. Add dye and fragrance from our fresh, modern range of options for truly delicious candles for a wedding, for gifts, or for your home of course. This is a fine one to make with children – although hot things are involved, that makes it more exciting! I fondly recall making candles for the Christmas table with my mother. A pot and a heatproof bowl that sits in it. 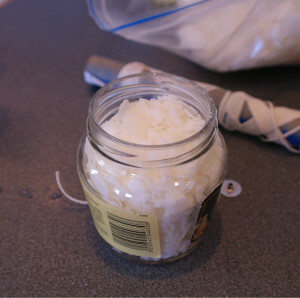 Measure out the wax flakes—the easiest way is to fill each candle container TWICE because you need twice the volume of flakes, and put the flakes into the bowl to melt. I used this cute mustard jar, and soaked the label off before proceeding. 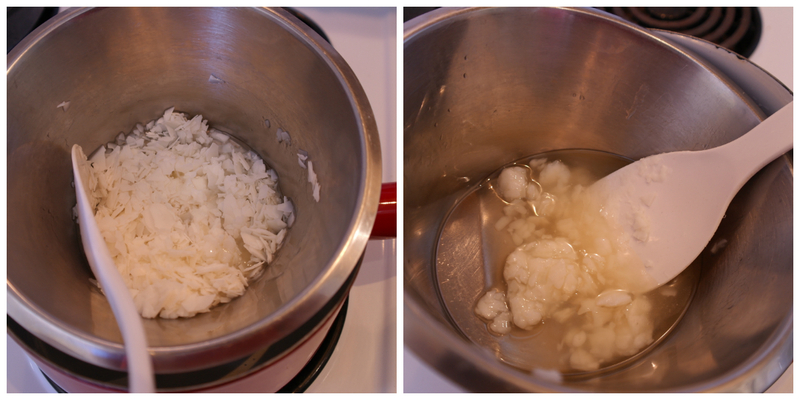 Just soak in hot water for a few minutes, peel it off, and dry really well. Stir the wax occasionally – it melts fairly fast. Apply the glue to the base of the wick, then stick the base to the inside base of the jar. I used a knife to move it around a little then put some pressure onto the wick base until the glue set – only about 20 seconds. 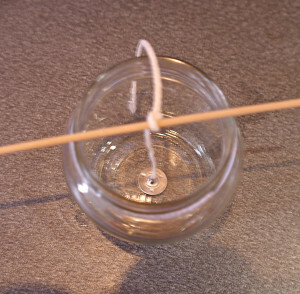 To hold the wick in place, make a loose single knot in the wick, thread the skewer through it, then gently wriggle the knot until the wick is straight up while the skewer rests on the rim. Not taut, not sagging. Back to the wax. If you are adding colour, do so when the wax is melted and stir until it is completely dispersed. 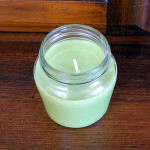 I used Lime Green, just a small shave off the block was enough for this candle. Now remove the bowl from the pot of water, and turn off the element. If you are adding fragrance, add a few drops now. I used Neroli and Bergamot, which is a fresh, modern sweet scent – I love it! 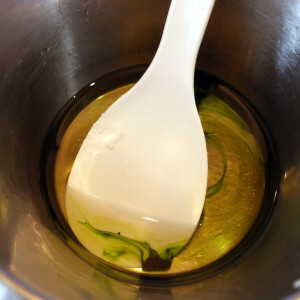 Don’t add scent when the wax is still on the stove or it will evaporate away. The colour looks much darker and more intense than it does when the candle is set. 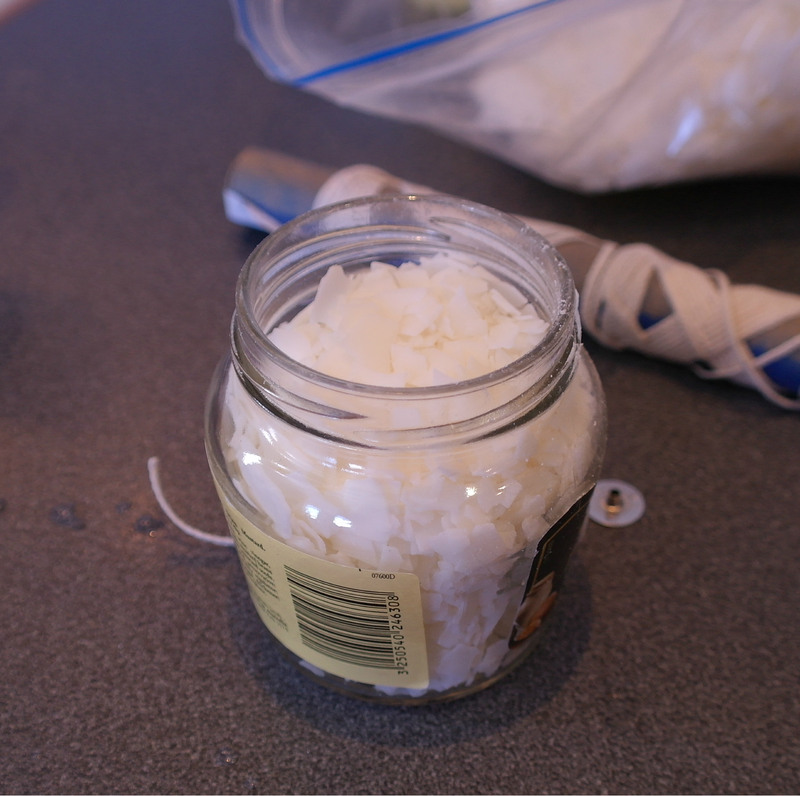 Before pouring the wax into the jar, you should warm up the jar. This stops the wax from pulling away from the jar. I did this by dipping and holding the jar about half way into the pot of water for a few seconds, and drying it thoroughly. 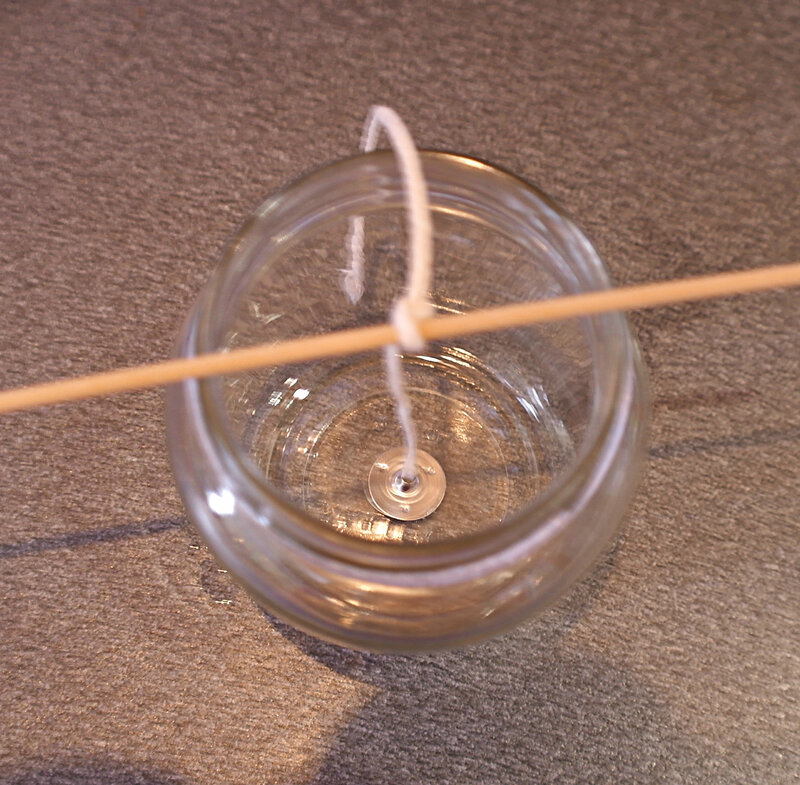 Obviously you don’t want to get water into the jar at this stage with the wick in place. 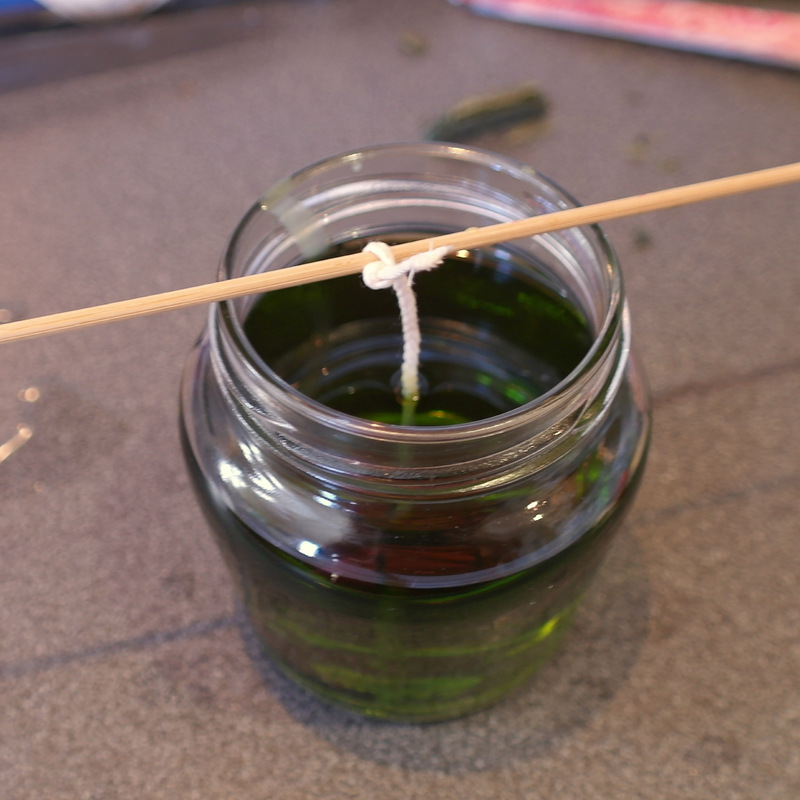 Pour the wax carefully into the jar, avoiding getting it all over the wick. My bowl had no pourer in the rim but it went in just fine. Now you need to leave the candle to set. See the difference in colour and texture when it cools! Finally, remove the skewer and trim the wick to about 1cm. 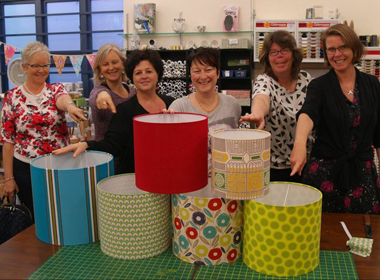 If you are presenting your jar candles as a gift, you could tie a ribbon around the neck, maybe cover the lid with Christmas fabric, or paint it, or attach a label, or cover in Christmas wrap using Mod Podge. So many options! I guess you could leave it declaring the contents to be mustard, and surprise the recipient!